Welcome to our Community Project of 2017 (you can see our last one in 2014 here)! We propose to do a series of – fun and lightearted – interviews which help us learn a bit more about our awesome community, and hopefully unravel some juicy details about our readers. If you would like to get involved, contact us. Thanks for doing our little interview! Can you introduce yourselves? Sisqi: Hello! Glad to participate 🙂 I’m Inge. I’ve started my gaming experience after Gamrok bought me a Nintendo DS (my first gaming platform). After watching my man play WoW for four years, I’ve finally jumped on the Blizzard train and got completely hooked. This sounds similar to our story! I also like hack ‘n slash games like Diablo and POE, but WoW is my big true passion. Gamrok: Thanks for having me on your blog! My name is Christophe and I play video games for more than 30 years. It all started with a Commodore 64 (Maniac Mansion), then an Amiga 500 (Monkey Island), and a PC (Doom2). I’ve discovered Blizzard with Diablo, but it’s with World of Warcraft that it truly became a passion. I also enjoy hack’n slash games and, occasionally, FPSs. In real life, I work in an office, my life starts at 16h00’. Could you share a pic of you together – either IRL or in game, we don’t mind! How long have you been together and where did you meet? We’ve met 15 years ago on the forum of a Finnish rock band. Six months later we moved in together, one year after that we got married (7th of June 2003)… that was 14 years ago. Gamrok moved from the French part of Belgium to Sisqi’s town, which is located in the Dutch part. We lived there for 11 years, then we moved to Brussels, the only part of Belgium where you can speak both languages. We now work in the same tower, so we can share our lunchtimes and we don’t have to commute anymore (more gaming). Sounds win/win to us. 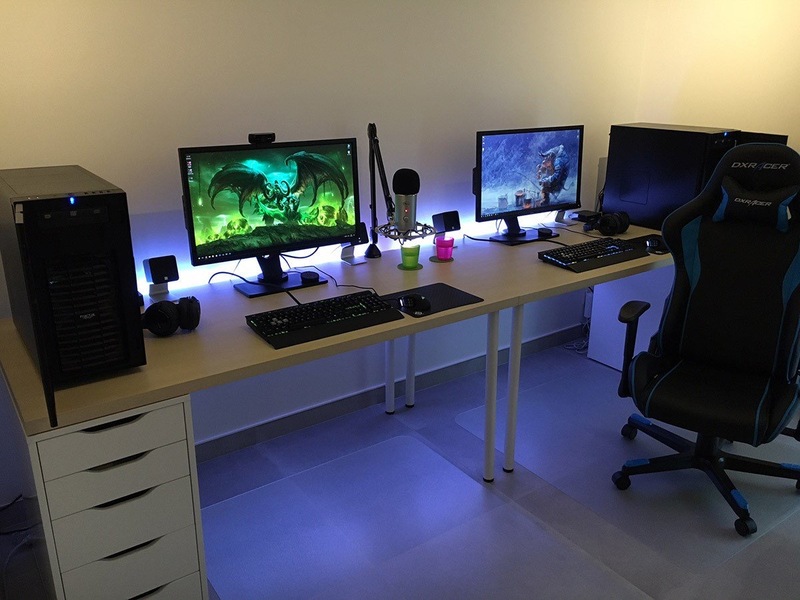 Show us a picture of your setup – do you have a cute couple thing going on, all cosy? This is so tidy, I’m in awe! So, do you tend to play the same games together or prefer to keep gaming life separate? Sometimes Gamrok likes to try out a new FPS, which Sisqi can’t play due to motion sickness. Other than that, we prefer to game together, whether it’s in WoW or in a Hack’n Slash. It’s all about discovering and sharing new experiences. That’s where all the fun is at for us. With the current political situation it’s only right we ask your affiliation: HORDE OR ALLIANCE? For the Horde! 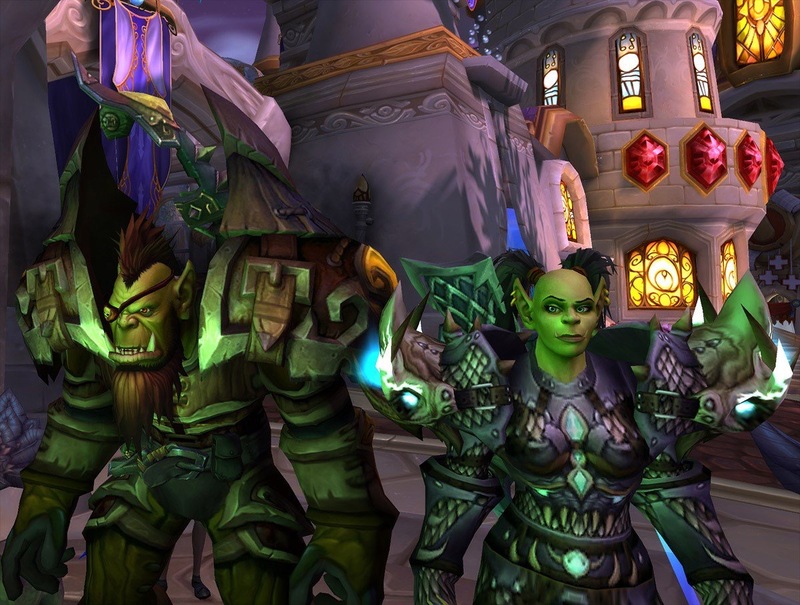 We’ve played Alliance on and off but our true allegiance lies with the Horde ;p Even if we love the cute cities of the Alliance, we prefer the characters of the Horde. No offense, but we couldn’t serve the Wrynn family. Haha! Ganking other players in PvP world quests arenas is what we enjoy most at the moment (we’re even leveling 2 rogues especially for that purpose). Savage! That’s the Horde for you 😉 We also love to quest together. World quests, dailies… No matter how they call it nowadays, they are our favourites! As a couple, do you find sharing your gaming hobby helps your relationship? WoW isn’t just a game, there is a gigantic community behind it: artists we support, YouTubers we watch, community projects,… It’s really great to share all that with your other half. It really is, being a tiny part of such an awesome community is lovely. *ahem* who rides who on the two seater mount? Who is the raid leader in your relationship?! Gamrok: A few years ago, Sisqi joined me in the game. At that time, she wasn’t really used to game, she was bumping in the walls. Now she’s the top DPS and she’s a real brute in PvP. But she’s too modest to admit it. Girl POWER! What’s been the biggest, how can I say this… marital dispute… whilst gaming together? One of you has to kill 100 kobolds and one has to collect the 100 shiny beads they drop… who does which task and why? We’re two hunters, so we mostly AOE the hell out of everything, then we both loot. Where do you see your future in gaming? Ok, the million pound question. You’re farming a rare mount. Neither of you has it. It drops. Who gets it?!! We’ll most likely insist on eachother until we /roll, otherwise we’ll both end up without. Thanks so much to you both for answering our questions. You sound like proper Blizzard fans and we love it! Check out Sisqi and Gamrok’s bios below. This entry was posted in Couples Who Slay Together, Mini-Series and tagged gaming couples, relationships, World of Warcraft. Bookmark the permalink. Gosh, I was gonna say, such a tidy set up O.o /Looks around her set up and sighs heavily….I am going to clean up this week…Well, next week. Hmmm. You make an excellent case…Though. Anduin has grown into something far better than just an expansion ago. You have not watched the last cinematic with him? Gosh, I adored that, honestly, and I used to think he was…Well, not very appealing at all. Thank you for reading 🙂 I fear we are drawing to an end, but the response has been incredible and I’ve loved getting to know some of these people a little better!